Another excellent by Ted McLaughlin at Jobsanger: This is what the Republican "trickle-down" economic policy has done to income growth in the United States. As you can see, between 1948 and 1979 the bottom 90% of the population got 67% of the growth in income while the top 10% got about 33%. That's a little unbalanced, but not outrageously so, and the result was that the economy worked for everyone -- which is what it's supposed to do. But then Reagan was elected in 1980 and he started to institute the era of "trickle-down" economic policy -- the idea that if the rich are allowed to make enormous profits they will share that money with everyone else. It was a stupid idea, and nothing trickled down to anyone -- it just went into the bank accounts of the rich and sat there. By the time Bush was president the full effects of the "trickle-down" economic policies were being felt. And they had a devastating effect on income growth for most Americans. During the Bush years (2000-2007) the top 10% had ALL of the growth in income (and about 3/4 of that income growth went to the top 1%), while the bottom 90% of Americans actually had their income drop. This is the primary cause of the current serious recession being experienced by most Americans (the financial bungling on Wall Street was just the trigger -- not the cause). So what do Republicans think is the solution to this mess. Well, more of the same. They just forced a massive tax giveaway to the rich which increased the deficit by nearly 50%. Now they say the deficit must be cut, and of course, they want the burden of those cuts to be born by the bottom 90% of the population. I can't believe anyone can think this is fair. 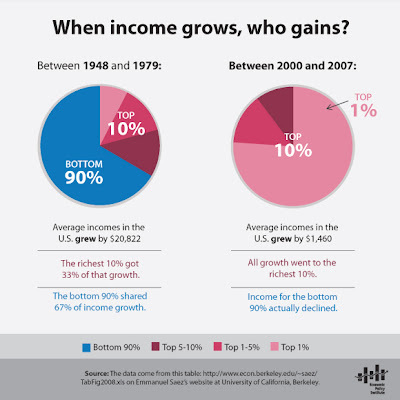 Allowing all income growth to go to the top 10% is simply indefensible. "Trickle-down" economics must be discarded (and never tried again), and the richest 10% of Americans must be asked to shoulder their share of the burden by paying more in taxes. This must be done to fund education and job creation to help the bottom 90%. Some will scream that this is "income redistribution". Americans have been propagandized into thinking that the redistribution of income is a bad thing (and synonymous with socialism). What they don't realize is that all economies redistribute income, including capitalist or "free enterprise" systems. The "trickle-down" economic policy of the Republicans redistributed income away from the bottom 90% of Americans, and put it all into the hands of the top 10%. It is time to reverse this trend and institute policies that will insure a more equitable distribution of income for all Americans. Continuing current economic policy will only make the country's economy worse.